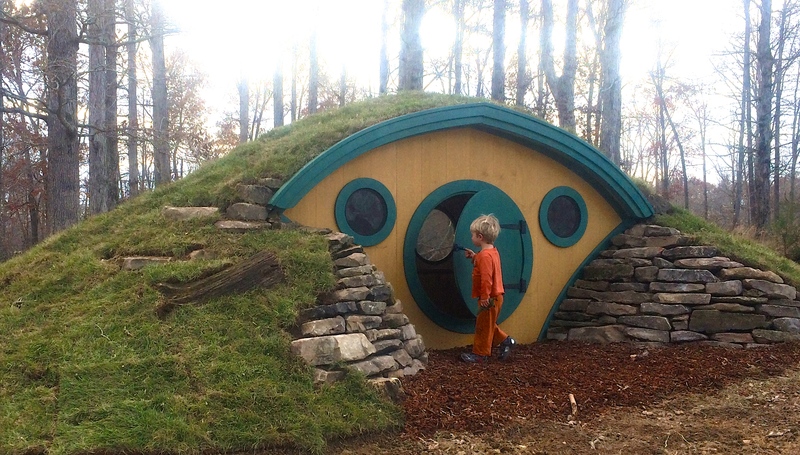 We have three Hobbit Hole playhouse designs to choose from: Big Merry, Little Merry, and Bag End. The Big Merry and Bag End (pictured at right) are scaled larger than most traditional playhouse designs and are great for "big kids" to have fun with, too. Their size is very popular with families who have multiple and/or older children because the kids get a clubhouse that they can call their own. Though not designed as a child's playhouse, the adult-sized Faehaven design allows the entire family to enjoy your backyard retreat, and is a favorite with grandparents. Our unique wooden play house designs will transform any backyard into an outdoor play fantasy. Please click to the individual product pages linked below for pricing and detailed specification information. Don't forget to Contact Us with any questions!